Tennessee’s coaching staff is trying to put together an elite 2019 recruiting class, and they’re already laying a strong foundation for their 2020 class as well. And on Wednesday, the top recruit from the state of Tennessee in the 2020 class included the Vols as one of his top teams. 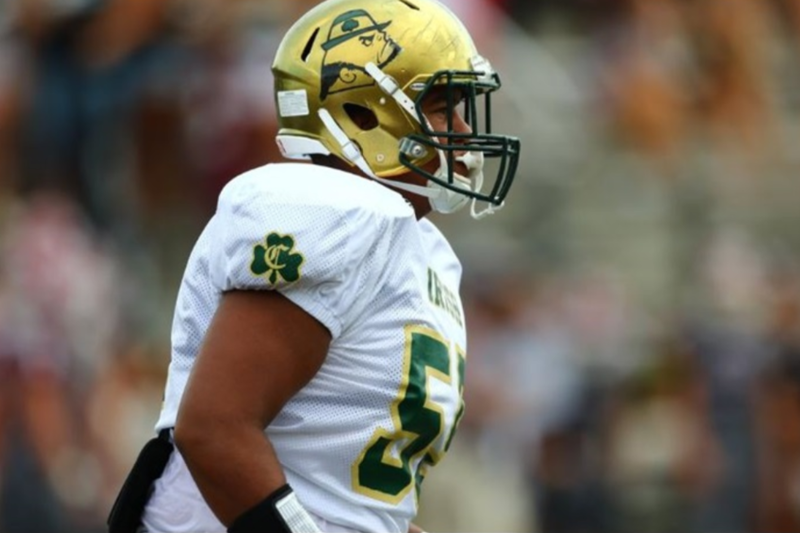 Bryn Tucker is an elite four-star offensive tackle who plays for Knoxville Catholic. He put out a list of his top five schools on July 4th, and he included Tennessee along with four other top programs in college football. The Vols’ previous coaching staff offered Tucker, but he’s developed a strong relationship with UT’s new coaches and has already unofficially visited Tennessee’s campus twice in 2018. Along with the teams in his top five, he holds offers from Alabama, Georgia, Florida, Ohio State, Nebraska, and others. According to the 247Sports Composite rankings, Tucker is the No. 44 overall player and No. 6 offensive tackle in the 2020 class. He tops what expects to be an extremely talented class of Tennessee prospects in the 2020 cycle. At 6-foot-5, 300 pounds, Tucker already has an excellent frame and uses that to his advantage in high school. He absolutely mauls some of the kids in his highlight film, and he’s very aggressive off the snap. He’s exceptionally good at run blocking, and he’s one of the more tenacious blockers you’ll see. Tucker plays till the whistle sounds, and he often drives defenders into the ground and stays on top of them till the play is over. Tucker is originally from Shelbyville, TN but moved to attend Catholic heading into his freshman year of high school. Last year, he played on the opposite end of the offensive line with five-star Georgia signee Cade Mays, and he’ll be playing alongside Cade’s little brother and fellow class of 2020 offensive lineman Cooper Mays this season. Both Cooper and Tucker are targets for the Vols in next year’s recruiting cycle. Tennessee missed out on some of the top talent inside their state borders during the 2018 class. But they’re looking to secure the elite talent in the state in the 2020 cycle, and that starts with getting Tucker to commit. Right now, the Vols are in a good spot with the No. 1 prospect in the state, and they will keep pushing for him moving forward.